Who would have thought in 1980 that the Roland TR-808 Rhythm Composer would change drum machines and dance music forever? If you went out dancing this weekend, you probably heard its distinctive sounds. Well, if you’re the sort of person who cracks a smile every time you check the time and it’s 8:08am, you’re probably already doing something to celebrate the eighth of August, “808 day.” So here’s a video for even more. The ad copy in this ad’s voiceover? All totally real. 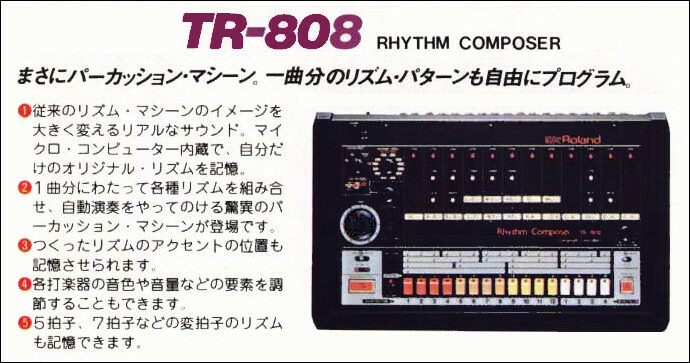 This is actually text Roland used to describe their TR-808 in ads from the era – see below. And it has all the trappings of the 80s. Weird future visor glasses – check. (I need some of those for my next gig.) Electro bassline – check. Swooshing sounds, flying text, everyone seeming to get sucked into the world of Tron – mais oui. It appears to be a (contemporary?) video ad using text from magazine copy made at the time, though unclear. And, of course, you get the singular key to all 80s design, which is the ubiquitous ITC Serif Gothic designed by Herb Lubalin and Tony DeSpigna and distributed by Lubalin. That typeface was already associated with the graphic identity of Star Wars by the time the 808 came out, with a lot of science fiction and fantasy (and Star Trek, whose title style is mimicked here) following suit. The panel labels were (more practically) all set in Roland’s signature Helvetica, but Roland themselves made the 808’s banner text in that type. Actually, even that typeface is signifiant. Kudos to Detroit’s techno rebels for working out that what the 808 represented in all its distinctive weirdness was not a crappy rendition of acoustic drums, but something that sounded futuristic. And perhaps the reason it still sounds futuristic to us now is, like that type, it has embedded itself in a science fiction milieu. Note the key phrase: “more variations and effects than virtually any other machine on the market.” That’s because the LinnDrum LM-1 was still more sophisticated than the 808. But the LM-1 also cost several times the price, and even though the 808 wasn’t a mass hit, the 808 production run numbered 12,000 while the LM-1 was in only hundreds. But there are clues to the 808’s success: rhythmic variations, a clear visualization of rhythmic structure on the front panel, and “computer controlled” precision (which you might think broadly speaks to what would happen to dance music in general in coming years with the forward march of MIDI). They even get in sync there. 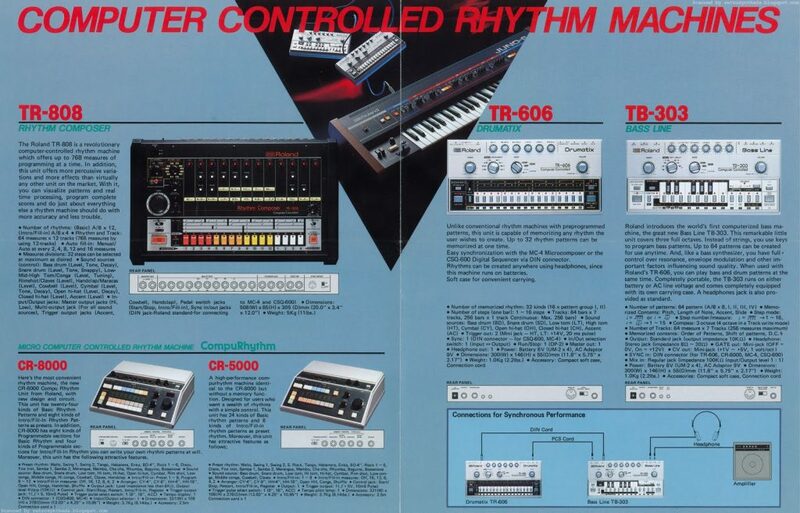 What they got wrong in early ad copy – indeed, what Roland has in some of our view gotten “wrong” on various occasions – is “realistic sounds.” It’s not that the 808 was unrealistic, so much as realism wasn’t what people found attractive. The reason you still hear the 808 in the world’s dance floors it that the world moved on, and decided that the 808 was a new set of sounds – not what you get out of acoustic instruments. Got some other 808 goodies or memories? Do share in comments. Thanks to media artist/composer Martin Backes for the link.